In general, the concept of workforce diversity has gained enormous support over the past decade, due to international politics of economic competition, technological progress, increasing emphasis on the importance of human rights, and immigration. The chapter discusses answers to the question: in the face of this consensus, why are xenophobic arguments (communicated worldwide through mass media) increasingly allowed to foster global climates of fear of, and resistance to, immigrant labour? Answers seem to lie in geopolitics and social pressures on governments that constrain them to discriminate against migrants and refugees seeking immigration. Reasons for this are discussed and possible remedies suggested. No two human beings are alike; people are different not only in gender, culture, race, social and psychological characteristics but also in their perspectives and prejudices. All societies have always discriminated on these bases (Kruglanski, Arie, & Stroebe, 2012), but The Universal Declaration of Human Rights (United Nations, 1948) was proclaimed in Paris on December 10, 1948 as a common standard for all peoples and all nations. For the first time it established fundamental human rights that must be universally protected with non-discrimination as an overriding principle. This principle is present in all the major human rights treaties that followed and provides the central theme of some international human rights conventions such as the International convention on the elimination of all forms of racial discrimination (United Nations Human Rights Office of the High Commissioner, 1969). Diversity in employment practices not only respects and protects human rights but has been shown to benefit organizational and national economies (Dustmann, Casanova, Preston, Fertig, & Schmidt, 2003; Saxena, 2014). Given the weight of opinion on the humanitarian and practical, local and national benefits of a diverse population from which to recruit workers, why the present climate of prejudice against immigrants? The chapter discusses two aspects of the management of diversity. The first is recognition of its importance not only for human rights but also for organizational and national prosperity. The second is the growing social and political prejudice against immigrant labour - resulting partly from recent massive increases worldwide of refugee immigrants (Triandafyllidou, 2015). This is now one of the most contested items on the political agendas of liberal states across Europe and North America. The objectives of the chapter are to identify reasons for this conflict of interests and to seek practical ways to resolve or at least reduce it. Conflict arises because there is, on one hand, recognition of the practical and humanitarian importance of workforce diversity; and on the other hand, global discrimination against employment of immigrants. The research basis was a literature review covering books, journal and newspaper articles, social media, and related websites. 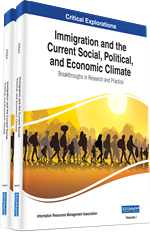 Thus, the methodology was qualitative, a form of exploratory research – in this case to gain understanding of the underlying reasons, opinions, and motivations behind the geopolitics of immigrant labour; and to seek support for the thesis of the chapter: that geopolitics, social and media pressures on governments and organizations constrain them to discriminate against migrants and refugees seeking immigration. For the purposes of the research, the following definitions were made based on the literature review.